Many things find a piquant and interested perch in my thoughts. 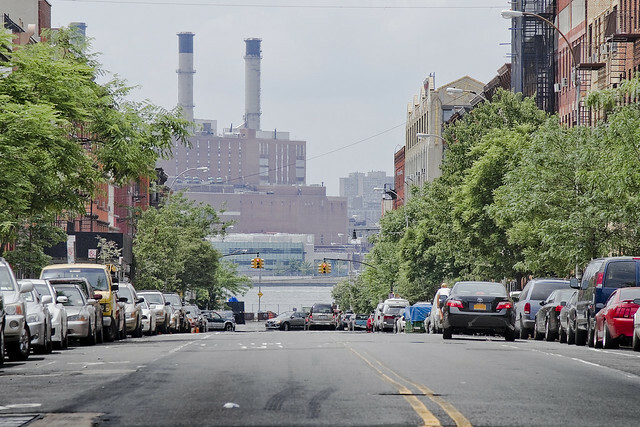 Autocthonic, these wonderings are often based on observations of a block or two of grandiose structures which seem out of place in modern context, Greenpoint Avenue between Manhattan Ave. and the East River is just one. There is a distinct and obviously missing element which once defined its “reason for being”, and like many of the other occlusions which abound along the coastline of North Brooklyn and Western Queens- the answer is presented by First Calvary Cemetery. 1865: This act incorporates the Green Point and Calvary Railroad Company, and authorizes the construction of a railroad, to be operated by horse power only, from at or near the Green Point and Tenth street ferry, at the foot of Green Point avenue, in the city of Brooklyn, thence along Green Point avenue to Green Point avenue plank road, across the bridge over Newtown creek; thence easterly along said road to the easterly side of Calvary cemetery at or near the point where the, said road intersects the main road leading from Calvary cemetery to Hunter’s Point; thence to Central avenue; thence along Central avenue and Commercial street to Franklin avenue, to Freeman street, to Washington street, to the place of beginning. 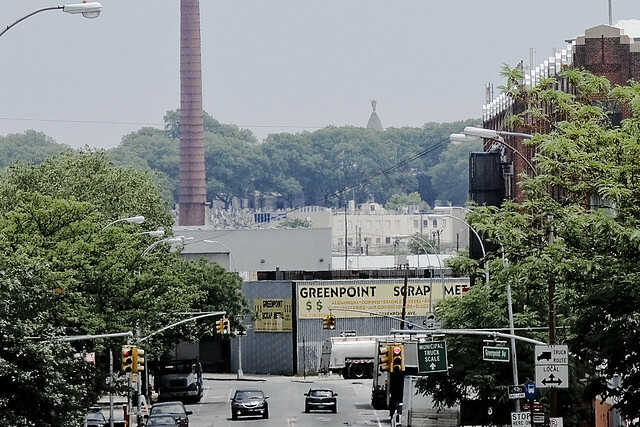 It’s no accident that Almiralls chapel is clearly visible from the paramount of Greenpoint Avenue at Manhattan Avenue. It’s a latecomer to the scene of course, having been built in the early years of the 20th century, but in 1865 when the Streetcar Line described above was mandated there were 1,000 interments a day going on at Calvary. Some portion of those were the graves which were being uprooted over in Manhattan of course, when cemeteries there were outlawed by the Rural Cemetery Act of 1848, but the majority of the dead coming to Queens were from a sausage grinder called the Five Points and the Tenth Street Ferry was how you got from points A to B for the funerals. The Green-point Ferries are from the foot of Green-Point Avenue, Brooklyn, E. D., to the foot of East Tenth and East Twenty-Third streets, New York. The first named route was established in 1852 (lease dated 1850), by the efforts of Mr. Neziah Bliss, of Green-Point; and was soon transferred to Mr. Shepard Knapp, being now held by G. Lee Knapp. The Twenty-Third street route was established in 1857, and held by St. Patrick’s Cathedral, per G. Lee Knapp. Rent of the Tenth street ferry, $1,300, and of the Twenty-Third street, $600 per annum, both expiring in 1874. It’s not the facts of the Ferry or Streetcar that make me curious, of course. What I’ve been wondering about lately is how the ethnic neighborhoods in the boroughs came to be. Everybody started in Manhattan on the Lower East Side, yet the Jews of Bayard Street and the Italians of Mulberry found a path to Williamsburg and Greenpoint (Tenth Street Ferry? ), while the Catholic Germans found their way to Ridgewood and Astoria (86th Street Ferry?). The Irish were everywhere, but made colonies of Woodside and Rockaway. 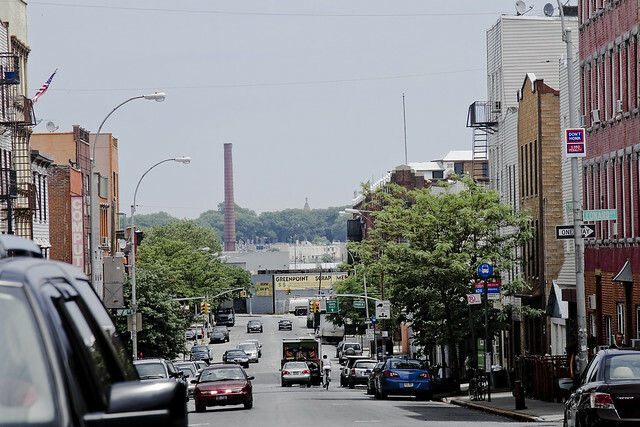 What natural synergies drew large populations of ethnic brethren to these neighborhoods? Work was certainly a factor (garment and stone industries in the industrial mills of Newtown Creek and Williamsburg, etc. ), but I’m wondering if it wasn’t the lost Ferry and Streetcar connections which allowed and encouraged these ethnic populations to agglutinate. Tenth Street Ferry Branch (color cream): Runs from foot Chambers St., cor. West (ferry to Pavonia Ave., Jersey City and Erie R. R. Depot), through West to Charlton, to Prince, to Bowery, to Pitt St., to Ave. C, to foot E. 10th St. (Tenth St. Ferry to Greenpoint Ave., Brooklyn), returning by E. 10th St., to Ave. D, to E. llth St., to Ave. C, to E. 3d St., to 1st Ave., to Houston St., to West, to Chambers, cor. West. Family and friends emigrating together will settle close by as they did in the villages and towns of the old country. In lower Manhattan nearby where the transatlantic steamers dropped them off and in cheaper neighborhoods. People in new lands tend towards the familiar so these small groups attracted larger groups until an ethnic area grew. Nothing magical, just a normal desire for a better life. The answer to that question is simple: Life in the ethnic slums of lower Manhattan sucked big time. New neighborhoods sprang up along new streetcar lines and later new elevated lines which attracted a few of the emigrants. Word of mouth spread back to lower Manhattan about these new neighborhoods with plenty of land to be had at reasonable prices and the rest is history. My learned cousin has writen much on the subject at least from the perspective of the Italians.